LSU defeated Alabama 20���10 in Birmingham, Alabama in what was Bear Bryant's last game coaching against LSU, in 1982. LSU's defense held Alabama to 119 yards of total offense, as the Tigers defeated the Tide for the first time since 1970. 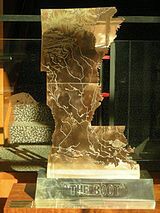 Later that week, LSU's defensive front seven of Melancon and Joiner (OLBs); Richardson and Williams (ILBs); and Marshall, Elko and Dardar (DL) were named the "Associated Press Sportswriters' Defensive Player of the Week." It was the first time an entire front-seven unit was so named. The 2003 LSU Tigers football team was coached by Nick Saban. 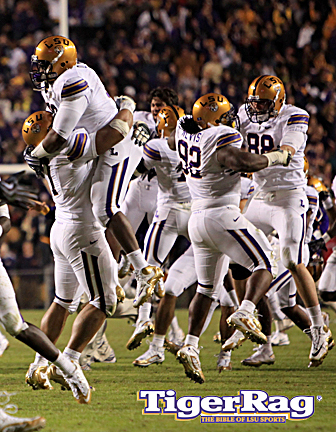 LSU won the BCS National Championship, the first national championship for LSU since 1958. The Tigers battled for an 11���1 regular season record and then defeated Georgia in the SEC Championship Game. 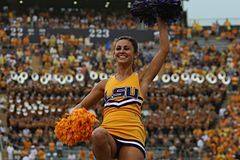 The LSU Tigers faced off against Oklahoma for the Bowl Championship Series (BCS) national title. 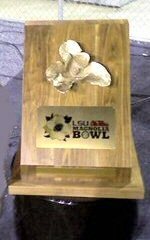 LSU beat Oklahoma 21–14 in the 2004 Sugar Bowl designated as the BCS National Championship Game.